In the second of my Tardis stops I’d like to take you to summer 321BC, but let’s not quibble over exact dates, she’ll find it. We are heading to Memphis to witness the funeral procession of Alexander the Great. Alexander died, in failing breath and fever, in the ancient palace of Nebuchadnezzar in Babylon sometime in the night between June 10th and 11th 323 BC. The Macedonians wept publicly en masse, and it is reported that the Achaemenid people shaved their heads in grief. As is befitting when a God passes, plans were set in place to fulfil his desire to be carried to a resting place suited to his status. Alexander wanted to go home to Macedonia – but this required preparation. First his body needed to be prepared for the long journey and Plutarch wrote that the finest Egyptian embalmers were brought in to preserve the physical form of the Godly figure. After this Chaldean embalmers were summoned to “make the body sweet-smelling and incorruptible.” The body was dressed in golden armour and draped in jewels before being placed in a sarcophagus. 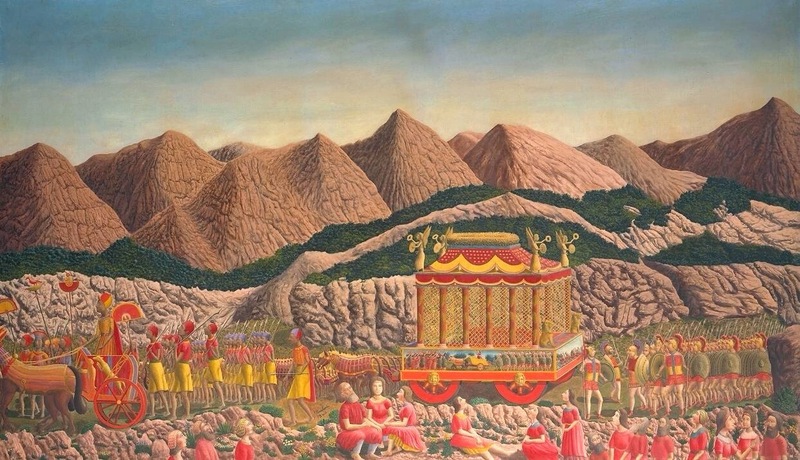 To transport Alexander the 3000 km home to Macedonia a vast catafalque, or funeral cart, was constructed. It took almost two years to build and was covered in beaten gold, silver and jewels. The cart rested on axles made from huge tree trunks carrying massive wheels. The whole cart carried carvings of great beasts and around the sides were carvings representing the most heroic moments of Alexander’s short life. The cart was almost ten metres high and was topped with winged Victories. It was pulled by a team of sixty-four mules, each one bred to be the strongest of its kind and dressed in splendour with golden harnesses. The funeral cortège travelled along the banks of the Euphrates and then headed east. All along the route the road was prepared, and thousands of people came to witness the passing of the golden carriage. Behind it trailed thousands more – Alexander’s most devoted warriors and followers. The procession continued to a point near the coast at Alexandria ad Issum (now Iskenderun in Turkey) and here is where we meet it. At this point there is a hinge moment in the story. It is unclear why the decision was made to wait, to delay the journey whilst they decided to travel on by sea or take the longer route by land. Waiting was fatal to the progress to Macedonia. Ptolemy arrived with a vast army and met the funeral procession and seized the cart. He may have believed that it was Alexander’s wish to be buried at Siwa, and so he took over the funeral procession steering it south – overland to Egypt. He wanted to create his own Alexandria, the final resting place of the God amongst the Gods of his own kingdom. A glorious ceremony was given as the cart arrived in Memphis where it remained for some years. A worshipped golden monument to the warrior’s past. The tomb was visited by many kings, and became a place of pilgrimage and a solid representation of Ptolemaic power. Eventually the reverence faded with the passage of time and, with the rise of Christianity, the tomb became more of a curiosity than a place of devotion. With Alexandria becoming a key Christian city, the old pagan temples in the city were sacked, and the body of Alexander lost. The golden jewelled carriage, and the body of the warrior king of Macedonia were lost, and has never been found. The resting place of Alexander remains lost. But the moment that we travel to is that fateful day on the coast. The see the brilliant blue of the sea and sky against the dazzling opulence of the glittering golden carriage as it slowly rolled into Alexandria ad Issum. Surrounded by crowds eager to catch a glimpse of the already fabled procession of the body of Alexander. To see the funeral procession at its most swollen and the cart hauled slowly by jewelled mules harnessed in gold and red. The noise and music of the crowd as the procession set up camp on the shore, resting to allow the people to witness the glory of Alexander’s travelling tomb. To be there to see the arrival of the armies of Ptolemy as they marched from the desert to surround the carriage and lead it on, south to the great cities of Egypt and to Memphis. This entry was posted in History, Mysteries, Travel and tagged Alexander the Great, ancient history, doctor who, Dr Who, Egypt, history, Macedonia, mysteries, tardis, time travel.